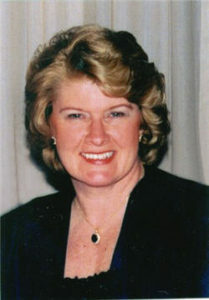 Award winning author Karen Patterson put together a great combination of tested recipes for readers who asked for a cookbook from the restaurants featured in Eating Your Way Across Ohio. Restaurant owners and managers generously shared some of their best recipes with Patterson, so readers can make the dishes at home, but eventually revisit the restaurants to try the original dish and compare their homemade results. Many recipes use down home ingredients, while other ingredients may be found in the gourmet section of the grocery store. Just like a satisfying meal, this book hits the spot. There are literally thousands of eating places across Ohio. Some are outstanding, some pretty good, some fair, and some not so good. 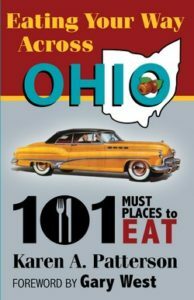 It seems it would be easy to identify “101 must places to eat” in the buckeye state, but is a much more daunting task than one would think. In researching her book, Eating Your Way Across Ohio, Chillicothe resident and author Karen Patterson travelled the state looking for the best places to grab a bite. These are locally owned, home town favorites that were visited personally by the author. The criteria for making the 101 was simple: it could not be a chain restaurant and, except for a rare exception, must have been in operation for at least five years. And, of course, the food had to be exceptionallydelicious! 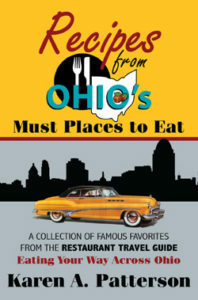 Beautifully illustrated with detailed directions and menu reviews, this book is guaranteed to thrill the traveler trekking across the the buckeye state in pursuit of his next dining delight. Award-winning author and journalist Karen Patterson brings to life her most personal account to date: the true story of her family, whose lives were forever altered by Hitler’s war. Abandoned to foster homes during the Great Depression, Gladys grew to be a strong woman with an independent spirit. Then she met Red, a gentle man of great humor. Red was seventeen when America entered WWII. Eager to do his part, he enlisted in the U.S. Army Air Corps, but not wanting to lose Gladys, the two married as soon as he completed his training. Red was shipped overseas to Great Britain, and Gladys began married life alone and pregnant. On Christmas Day in 1944, Red and the rest of the flight crew were ordered on a bombing mission. Caught in a battle with the Luftwaffe, his plane was severely damaged, and Red was forced to bail out over German territory. Captured and wounded, he endured a ninety-mile march before reaching the prisoner-of-war camp. Daily life became a miserable combination of intense cold and starvation. Stateside, Gladys gave birth to a healthy baby boy. For two years she was self-sufficient; taking care of her child, working, and saving money for the future. But when Red returned, he was angry, restless, and showed little interest in his son. The war may have been over, but for Gladys and Red, their greatest challenges lay before them. 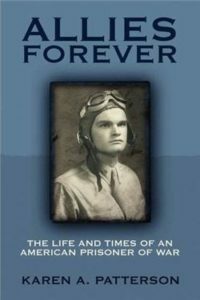 Allies Forever is an awe-inspiring testimony to the resilience of the human spirit during war times and a heartwarming story of what it means to be a family…even in difficult times. You won’t forget this story anytime soon! Long before commercially prepared seasoning salt, country cooks added a pinch of basil, thyme, lovage or a combination of herbal seasonings for that touch of something extra in their meals. Our ancestors did not have aspirin, antihistamines, diuretics, and the general pharmaceuticals that are available today to cure their ills. Instead, they used the power of herbs to relieve coughs and colds, clear the body of toxins, cleanse the skin, and even lighten the hair. These valuable plants are gaining in popularity today and many of those used in medicinal, culinary and personal hygiene are detailed in HERBS FOR ALL SEASONS. 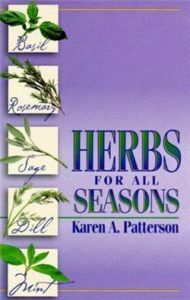 As the winner of the National Publishers Freedom Award, the Writer’s Digest Award of Merit, and the Apex Award for Publication Excellence, this fully illustrated guide covers more than 150 herbs and is filled with tips on growing, harvesting, and using these ancient plants.